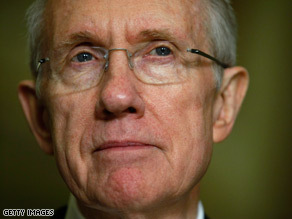 Senate Majority Leader Harry Reid is looking for additional votes out of an abundance of caution. WASHINGTON (CNN) - CNN has learned that one day after securing an agreement on a giant economic stimulus bill that is expected to pass narrowly with the votes of three moderate Republicans, Senate Majority Leader Harry Reid is calling other Republican centrists trying to persuade more of them to vote for the measure. He’s looking for additional votes out of an abundance of caution, an aide explained, after learning that ailing Sen. Ted Kennedy, who returned to Capitol Hill for votes earlier this week, has now gone back to Florida to continue his recovery from brain cancer and won’t be here for a final vote on the stimulus bill in the coming days. With Kennedy here, the Senate version of the bill passed 61-37 – just one vote more than needed. Reid is concerned that if a Democratic senator gets sick, or has some other unforeseen obligation, he could have trouble getting the bill passed. Reid is also concerned because the three GOP moderates who support the bill – Olympia Snowe and Susan Collins of Maine, and Arlen Specter of Pennsylvania – suggested they did not want provide the decisive 60th vote for passage. That would likely happen without Kennedy voting. So far, there’s no indication Reid has won any more GOP votes for the measure. But an aide to one of the GOP moderates, who asked not to be identified, doubted any of the moderates would drop off. “I can not imagine any of them would back away after all the painstaking negotiations,” the aide said. I want to see President Obama succeed with this action. However, I am cautious to believe that the leadership of Pelosi, Reed, Boehner and McConnel can lead us out of this mess. So far a lot of money has been given to banks and no one can even say where it went. It certainly is a disappointing package. Better than nothing, but research demonstrates that the arts generate jobs and purchasing FAR beyond their cost. Then there's the ATM – cut, but not eliminated. Why not save a bundle in one minute by requiring the federal government to negotiate the best price with drug companies for Medicare recipients? That would save HUGE sums, and our elderly would not have to go Canada or choose between drugs and food. This American foolishly paid off three mortgages in my lifetime, down to the last penny. There's nothing at all for responsible adults here. My CitiBank card just went from 9.99% to 16.99%. Why? I was told it was a "business decision." Never late, never skipped a payment. And Citi, who just got TARP funds, did it because they did it. I never felt less protected by my government than I do now. Grow up Dems! The package received just about enough accord to ripen into a bill. Do not, for chrissake, go overboard apropos the agreed upon numer of billions. The GOP is aching to make their stamp felt at the slightest opportunity. Vulture is a patient, but perilous bird. David, your rebuttal is off base. Louis was talking about the job creation aspect of the bill. You are talking about federal financing of infrastructure projects. This bill includes spending for projects that may very well provide a benefit to someone but not lasting jobs. This is the wrong bill for spending plans. Jobs are created by private companies who have a demand for their product or service that causes them to hire people. Creating artficial demand does not produce permanent jobs. You nitwits can't grasp the concept of what is in front of you as you are to busy hammering Bush, who is, was and will always be a DOLT, but he is gone, yay, time for you with BDS to move on. You geniuses that are hammering Steele and making your snide remarks and racist ones as well, HAVE NO CLUE as this man hammered Bush and Republicans when deserved and that is why I support him TOTALLY as the leader of the party, not the pig Rush, this man. If you want to attack the messenger while ignoring you and your children paying for frisbee golf courses, congressional furniture, bike paths and schools for Wisconsin that THEY DON'T NEED etc, etc without saying something about it, FEEL FREE, us non-sheep that can think beyond NPR, Keith Olbermann and that thirteen year old boy who is on after him, are going to TELL THE TRUTH about this pork laden bill that is payback to his supporters and will be very little to us REGULAR FOLKS. WE WANT a STIMULUS bill that is pork free, you want anything that this liar wants and that is scary as hell. New York times has 250 economists and Nobel prize winners saying this is a BAD BILL, are they all liars, haters, racists, rethuglicans, Rush lovers? Nope, they like me, are independent and smart and frankly forgot more than you sheep will ever KNOW. Al Franken hasn't stolen any election. The Minnesota courts are still determining the outcome. When Norm was claiming victory, at least Al didn't cry "thief"! He sat back, and let the processes and procedures in place do their job. When those processes, witnessed and agreed upon by both candidates, showed Franken the winner, Norm the whiner took it to court. While I do not live there, just by the way they are handling the situation they are in, I'd vote for Franken. Reid himself is a part of the problem, although not nearly as much as Pelosi is. I am hoping that a few more sensible members of the Senate, even though Republicans, will realize as Specter did, that they are there to represent their voters, not their party. I think that more of them will fall to Democratic challengers in the 2010 election if they do not realize that they must be a part of the solution. If you sit in the corner and say "I won't play" like most of the GOP are doing, you have no voice in what DOES get presented and voted on. If you dont agree with something, come up with a reasonable alternative. Good luck with that, Harry. I can't understand why anyone would not want to vote for an $800 billion bloated pork-spending stimulus bill that will provide hard-working Americans with an extra $13.00 per week on their paycheck. Democrats in office = inmates running the asylum. Lets march on Limbaughs Castle and have him tell us how much he loves us and not to worry. Go away Reid (and Pelosi). 2010 election is only too near. If they're up for re-election, I'm going to vote Republican! Obstruction of injustice is a noble act. SO, IN ESSENCE, THE GOP DID NOT LOSE THE ELECTION RIGHT? OR ELSE WE WOULD NOT NEED THE REPUGS. FOR ANYTHING. @Gort...you got your wish...the republicans don't have a choice about getting any money from the stimulus bill, in case you hadn't heard....they were never going to get any for their states from the getgo. That is why the wording in the bills were written so vaguely...500 million for this agency....1 billion for this federal agency...so that we Dems could dole it out to whomever we really wanted to in the end. Why do you think we haven't put it officially on paper yet? This brings up another story. How much sick time does a senator get. Does one get leave without pay? How many sick days does Senator Kennedy have on the books. An even better question, can the guy perform his job with his health. I like Sen. Kennedy, but for the sake of the nation he should step down, have his niece Caraline move to MA and have her take his place. Just a thought. Hmmm – it seems the public supports the stimulus by 59% to 33% in opposition. Gee, I wonder if perhaps the GOP is living in a dream world. I predict a few more Republican Senators will vote for this bill as a defense against losing their seat in 2010. The public definitely supports the bill by an increasing margin – it seems to go up a little every day. Republicans have proposed workable alternatives. If they are even allowed to bring them to a vote, the Dems have voted them down. Republicans aren't against a stimulus bill. They are against THIS bill because it is just a spending bill. If only more of the money were on things like actual infrastructure then that might get a more bipartisan response. REMEMBER, the only truly bipartisan vote on this was the vote against it in the house when all of the Republicans and 11 Democrats voted against it. They should worry about the country, not their political standing!! why would any Senator let alone a Republican Senator deal with the devil. @conniesz – people are sheep. Translation – We just lost a few dem senators on porkulus. Porkulus – Is what happens when dems are told to put every earmark they've ever wanted directly into a bill and label it 'stimulus'. Then use gloom and doom fear mongering to get half of congress to accept it. On top of that, have the nerve to praise it as a bi-partisan effort that you're proud of when the absolute opposite is true. We are going to have to TRY to quickly undue this insanity !